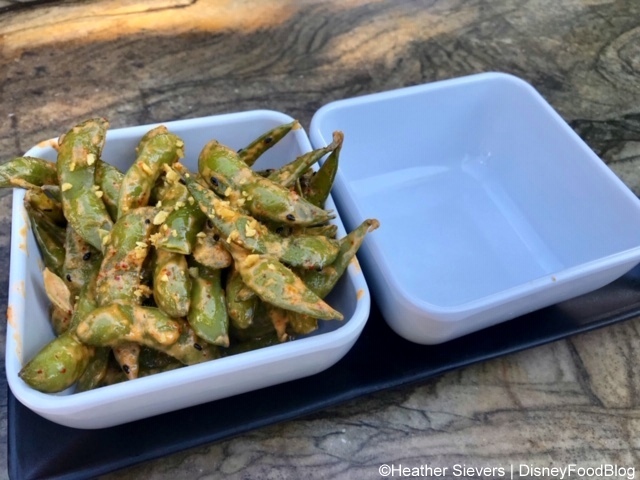 The lunch and dinner menu here has retained some of our old favorites (like Panko-Crusted Long Beans!) and added some newbies. 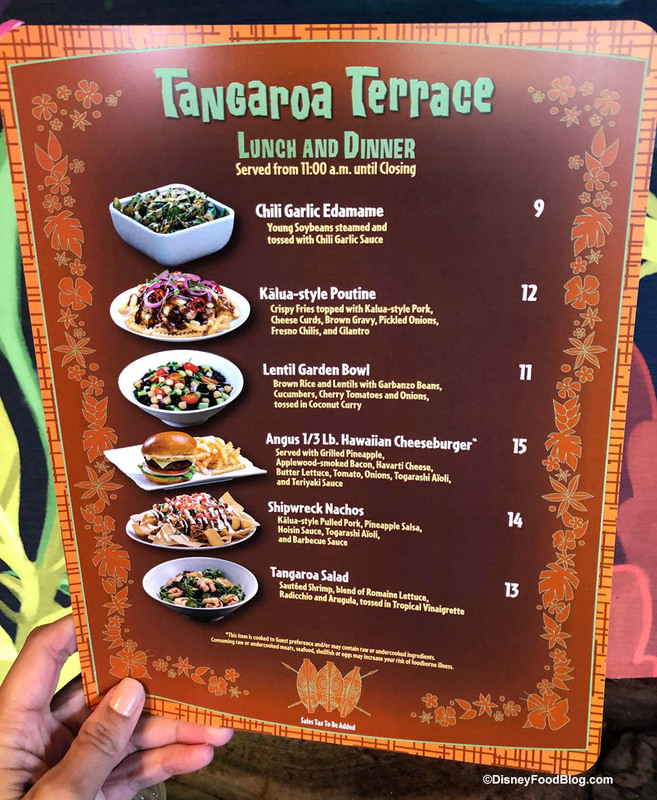 Come along as we dig into LUNCH at Tangaroa Terrace! 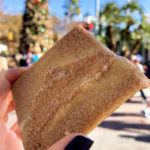 We already gave you a review of the breakfast goodies here, but two of our team members (including our intrepid Disneyland correspondent Heather (aloha, @DiningInDisney!)) 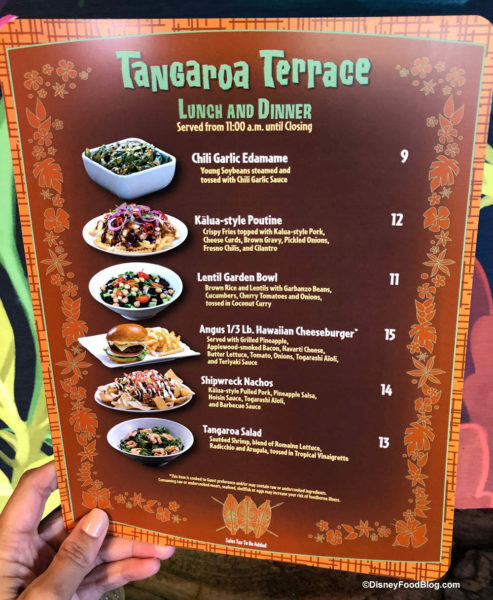 stopped into Tangaroa Terrace to show us what’s on the menu for lunch and dinner, too! 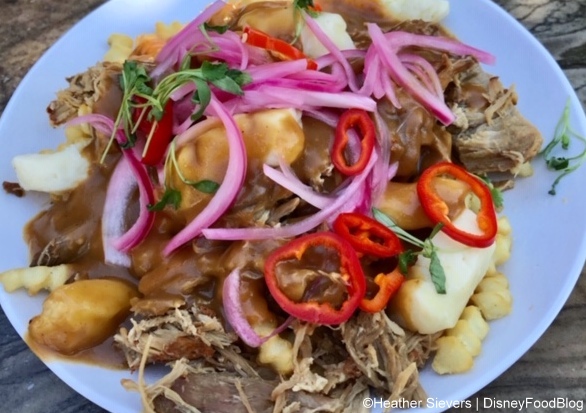 Believe it or not, this tropical-inspired locale has introduced a Kalua Style Pork Poutine! 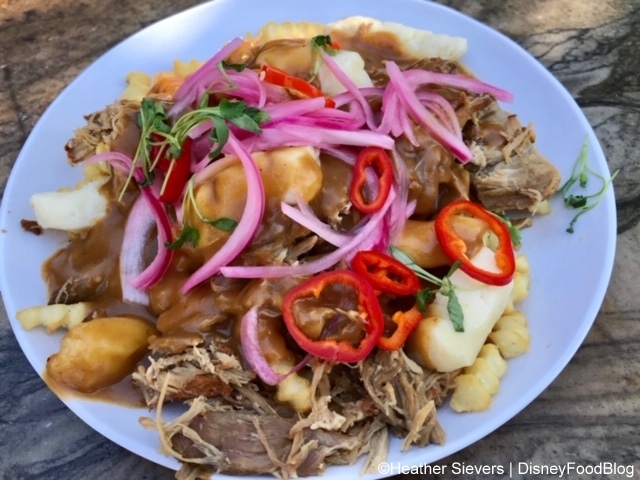 Once relegated to the tables of French Canadians, this French fry-based delicacy has become a true Disney trend (you can read about Disney World’s obsession with poutine here! ), and is given a decidedly island spin at Tangaroa. Kalua style pulled pork tops the fries, and plenty of awesome, colorful stuff tops the pork, too! Cheese curds and brown gravy — traditional poutine components — are here, plus pickled onions, Fresno chilies, and cilantro. It’s a wild combination that somehow works! We loooooove the base of crinkle fries, which are super crisp and sturdy enough for the toppings (even though very unconventional for traditional poutine). The most powerful flavor is the pickled onions, which add acidity that’s not typical of poutine. For $12, this was a great value — especially since it’s definitely big enough to share. 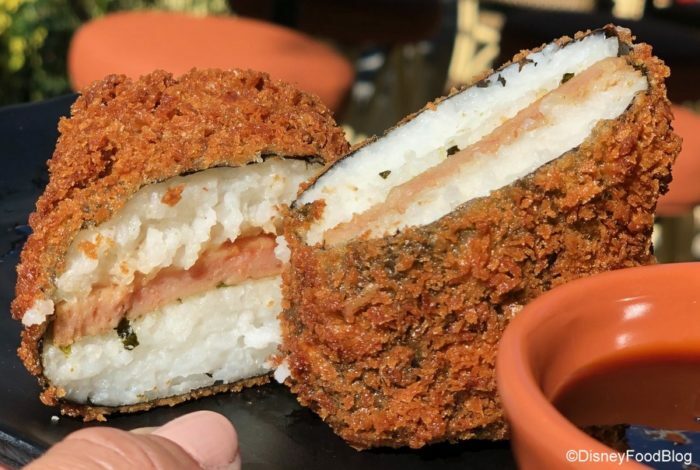 The Fried Spam Musubi is a classic island treat that’s… well, let’s say it’s just not for everyone. 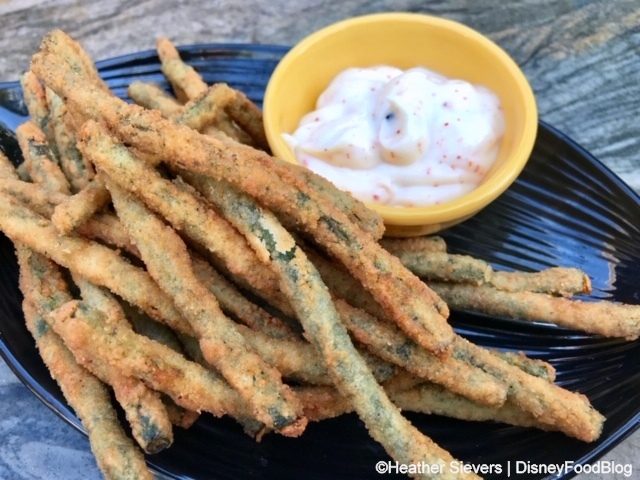 In Hawaii, this is often eaten as a snack or lunch, and we love the twist Tangaroa has put on this by deep frying it for a terrific outer layer of crunch. So satisfying. The Spam Musubi part of this is comprised of three ingredients: a slice of pan-fried Spam, some sticky white rice, and a nori wrapper. Essentially what Tangaroa has created is a Spam sandwich using rice instead of bread. The nori wrapper encircles the ‘sandwich’. 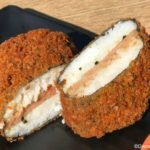 The entire thing is coated panko breadcrumbs and deep fried. 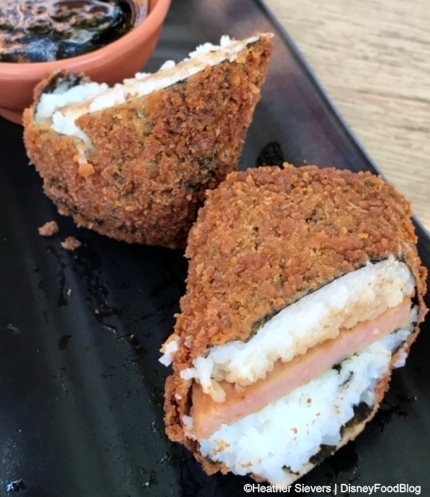 If you like Spam… and nori… and rice-heavy dishes… you’ll totally be into this! For us, it wasn’t our favorite. Still, it’s fun to try something that’s really location-specific — a Hawaiian delicacy, if you will. Of course, for $11 this might be too rich for a snack you’re trying just for fun. Shipwreck Nachos are a cool twist on a bar favorite. 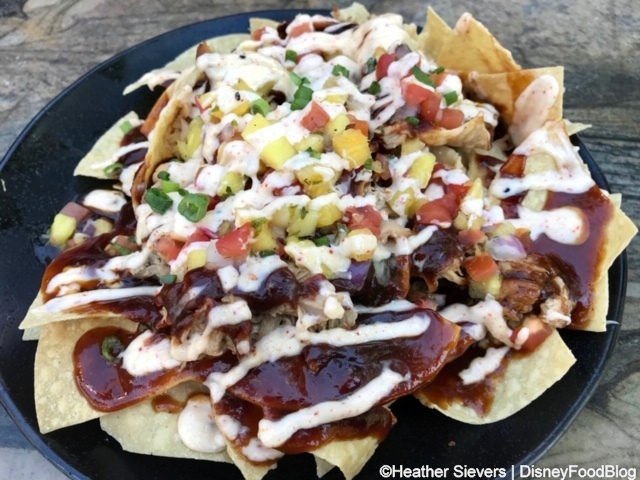 A bed of crispy tortilla chips is loaded with Kalua style pork, pineapple salsa, hoisin sauce, scallions, Togarashi aioli, and barbecue sauce. This is a texture and flavor mash-up we can’t get enough of. Seriously: it’s hard to stop eating these once you start. 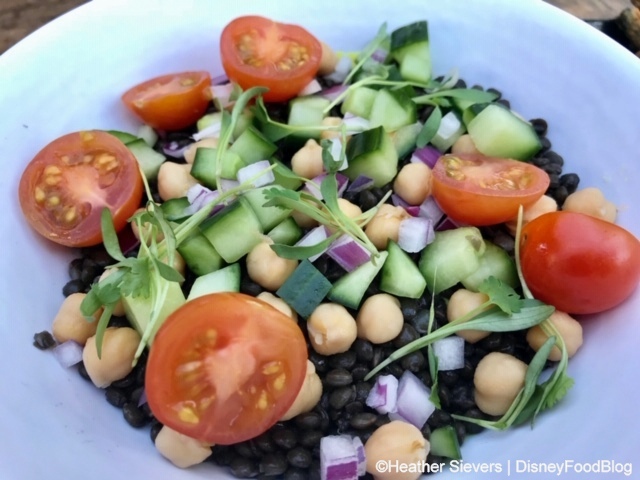 For a lighter option, go with the Lentil Garden Bowl. 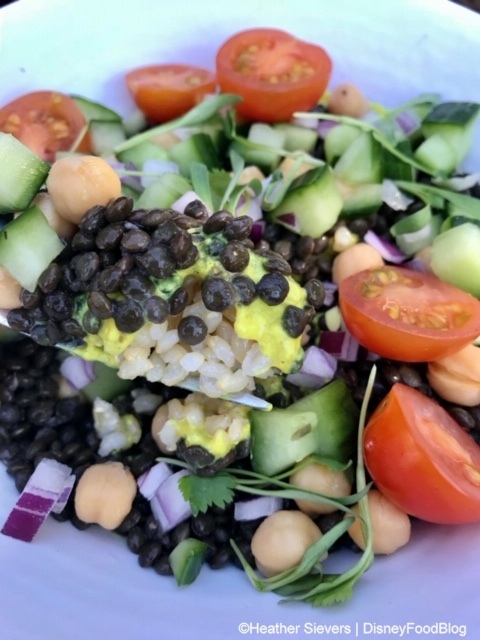 Black lentil and brown rice form the base, and fresh chickpeas, cucumbers, cherry tomatoes, and red onion are piled on top. Coconut curry dressing and cilantro finish this off. This is a tasty option for those who are determined to eat healthy, even in the face of many delicious, less health-conscious choices. It wasn’t our favorite, but it’s a great addition to round out the menu. 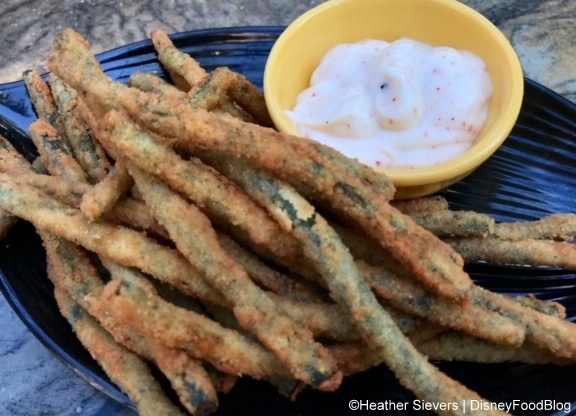 We love the Panko-Crusted Long Beans, so we’re really happy they’re back! These have an awesome crunch and a tasty breading that’s good even without the (ubiquitous) Togarashi aioli that’s served on the side. 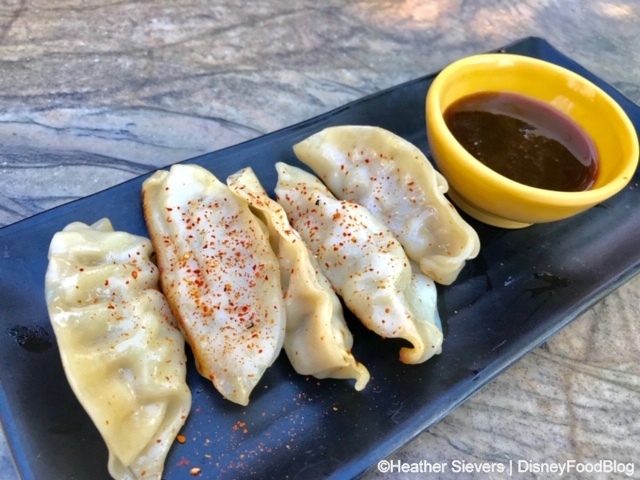 Another returning favorite: Pork Gyoza. 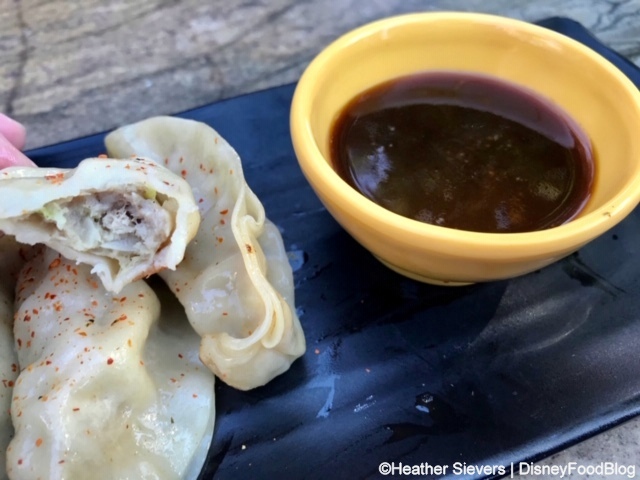 These are pork dumplings; gyoza is the term for this particular kind of Japanese dumpling wrapper. 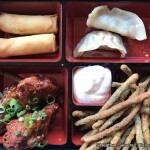 These are dusted with… Togarashi seasoning. And they’re perfectly formed and cooked. 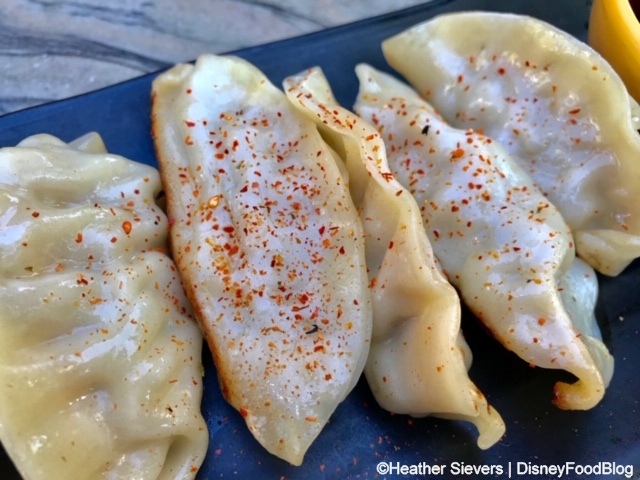 The bottoms have that quintessential pot sticker crust. The filling is pork and vegetable, with plenty of seasoning like garlic and ginger. 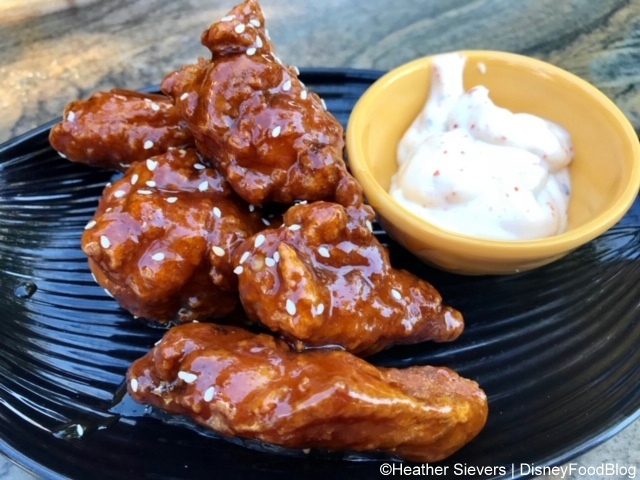 Ponzu sauce on the side makes a nice, salty partner. The seasoning on these is abundant and delicious. These are pretty healthy, but they’re also pretty addicting. 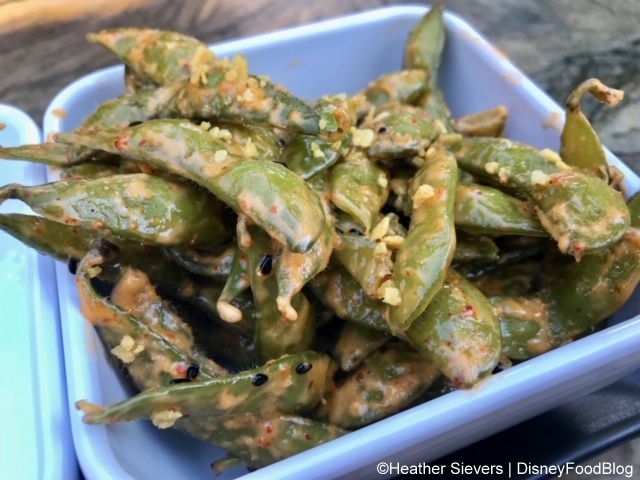 And if you’re just stopping in for a snack at Tangaroa, the Edamame will make a light eat that won’t weigh you down for the rest of your day. 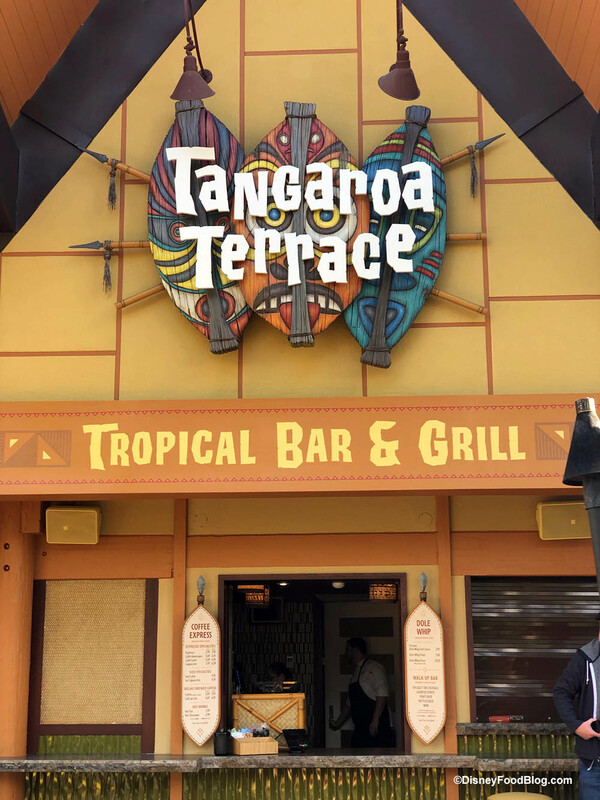 We are SO HAPPY Tangaroa Terrace has reopened! Not only is the space bright and fresh, but the food is, too! Even the heavier options — like Shipwreck Nachos and Kalua Style Pork Poutine — have enough freshness to keep things bright and refreshing. Definitely plan to stop into Tangaroa the next time you’re in the area! 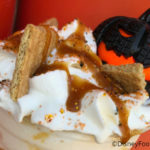 And don’t forget to get a Dole Whip for dessert! Next, read our Tangaroa Terrace Breakfast Review Here! 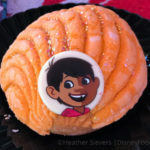 Sign up for the DFB Newsletter today — and you’ll never miss another bit of Disney Parks news! Which of these eats would you dig into first? Tell us in the comments! 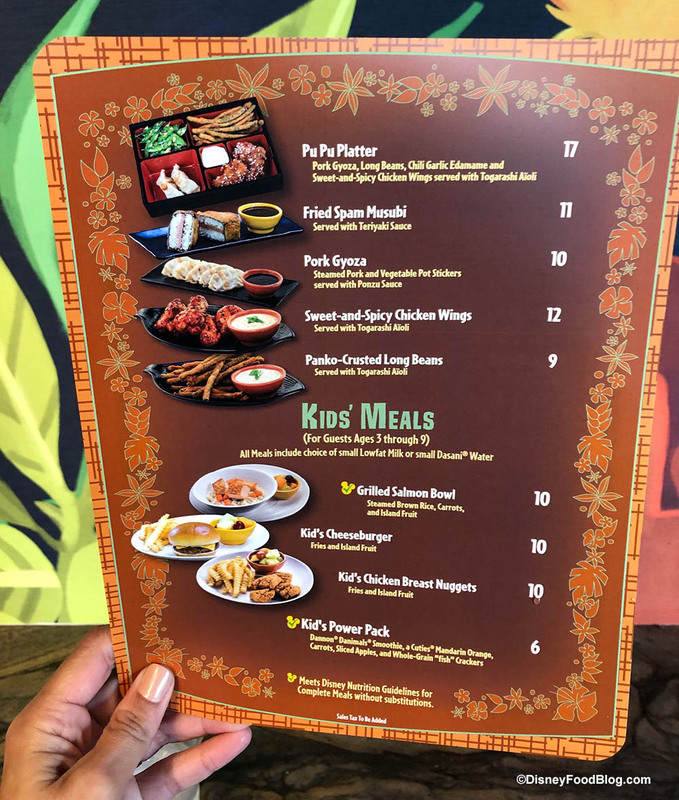 « FIRST LOOK: Breakfast Review and FOOD PHOTOS from the Newly Reopened Tangaroa Terrace at the Disneyland Hotel!